Minneapolis in the 90s is not revered as a significant time and place in the history of jazz, but it plays an important role in the materialization of the latest release on Anticon. Martin Dosh and Jon “Ghostband” Davis first crossed paths playing in jazz ensembles in that era. Those meetings and creative exchanges led to recorded collaborations like Davis providing bass on Dosh’s solo, self-titled debut in 2002. Fourteen years later, Dosh and Davis have combined for a project best described as a mind-meld, the merging of two self-sufficient innovators converging on common ground. 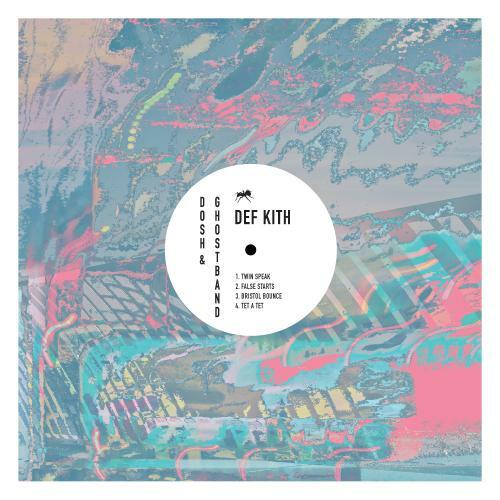 The Def Kith EP is three suites (“Twin Speak” is digital only) that masterfully carve a new path with a futurist mindset that keeps John Carpenter and Herbie Hancock relevant decades beyond their master works. Those two touch tones collide on “Tet a Tet” with an in-the-pocket tension that never eases, even as the percussion transgresses into a Chicago house pace. Indeed, lurking in the depths of each suite on the EP is the potential for unbridled movement that must be patiently discovered, like the groove that catapults “False Starts” out of its rigid programming. The Deth Kith EP thrives in a space that feels like IDM, but never quite commits to that head space entirely. Hints of kraut rock, jazz fusion, and nu-disco infiltrate the systematic production, sustaining metamorphosis until the needle reaches the center of the record. Dosh & Ghostband’s Def Kith EP is out today on Anticon. The duo plan to release an LP in the spring of 2015.